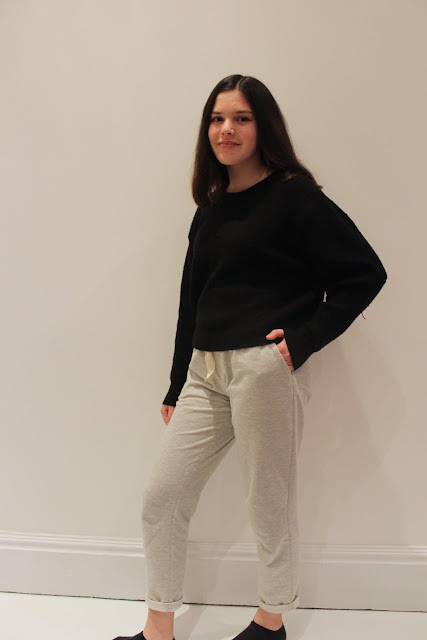 I've wanted to make a pair of jogging trousers for a while. Something comfortable to throw on when it's cold seems like the perfect garment in winter. I also wanted to find the perfect pattern and fabric so this make has taken longer than anticipated although I'm so pleased that I spent time planning before sewing. 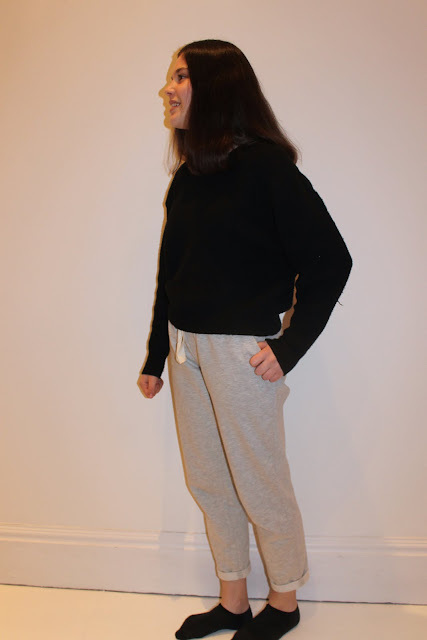 The main concept that I had in my head was a pair of jogging trousers that I could wear not to run in but just to wear, so I wanted something a bit smarter than an activewear fabric and also a pattern that had a few more interesting details. One of the key things that I wanted pattern wise was for there to be a faux-fly, a detail that I really like as it makes the trousers smarter but you don't actually have to sew in a zip. 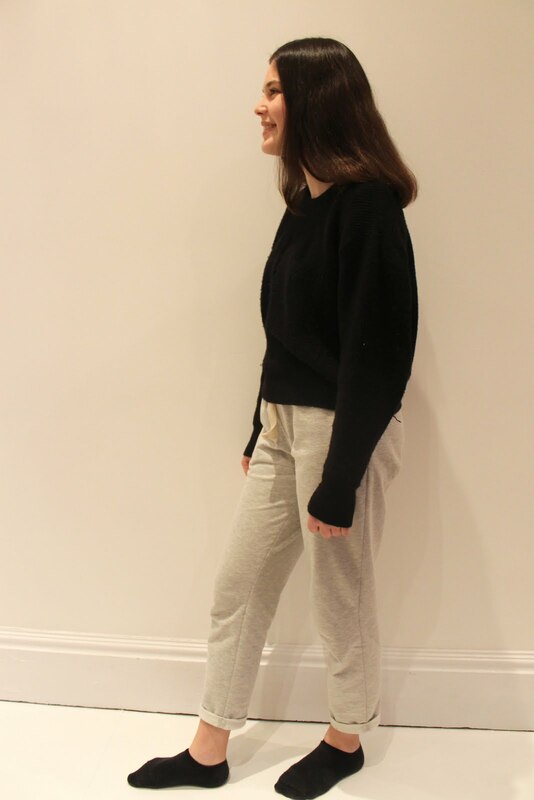 Finding a trouser pattern that ticked all the boxes was quite difficult: any without fastenings were designed for stretchy fabrics and therefore didn't have a faux-fly, and any designed for non-stretch fabrics had the opposite problem of having zips and buttonholes. I did find the perfect pattern in the end: the Papercut Patterns Anima Pants. The only change I made was to omit the cuffs as I knew that I wanted to roll the trousers up at the ends. It was the first time I've used a Papercut Patterns pattern although I can't think why as their collections are all stunning. The pattern cutting was impeccable, the only thing I found slightly frustrating was that there was no instruction booklet. Instead, the instructions were laid out on the same sheet as the pattern pieces. Rather than have to leave out a huge sheet of paper I photographed each step of the instructions which worked fine, but I definitely prefer having a palpable copy of the instructions on hand. This was the only default I found with the pattern though, and it's a minor default at that. I just love this pattern so much! I actually asked for it for my birthday alongside this gorgeous loopback jersey as I initially planned to sew the trousers in that fabric. The current season does mean that a lightweight fabric just wouldn't get as much wear though so I decided to save the blue jersey for spring (I'm already excited about making a second pair!) and make a grey pair in a thicker jersey for the time being. The problem now was, of course, choosing the fabric. I've mentioned several times that I much prefer buying fabric in person rather than online and I think that with knit fabrics in particular it's hard to know what to expect until they arrive. Because the weight and amount of stretch is so important when sewing with knits I rarely buy them online unless it's a manufacturer that I've used before. Having said this, buying fabric online can be a perfect alternative it's just that with these trousers in particular I wanted the fabric to be exactly right. I ended up pretty much stumbling into the perfect fabric! Upon a recent trip to Cambridge I had to, of course, visit Backstitch which is a gorgeous fabric shop. At the time I wasn't really sure whether or not I still wanted to make a pair of grey joggers but when I saw this fabric it was just perfect for what I had in mind. My Mum always selects great quality fabrics so I knew I wouldn't regret buying this one when she persuaded me to get it. It honestly is the perfect fabric for what I envisioned! It's a lovely shade of grey and fairly heavy weight. 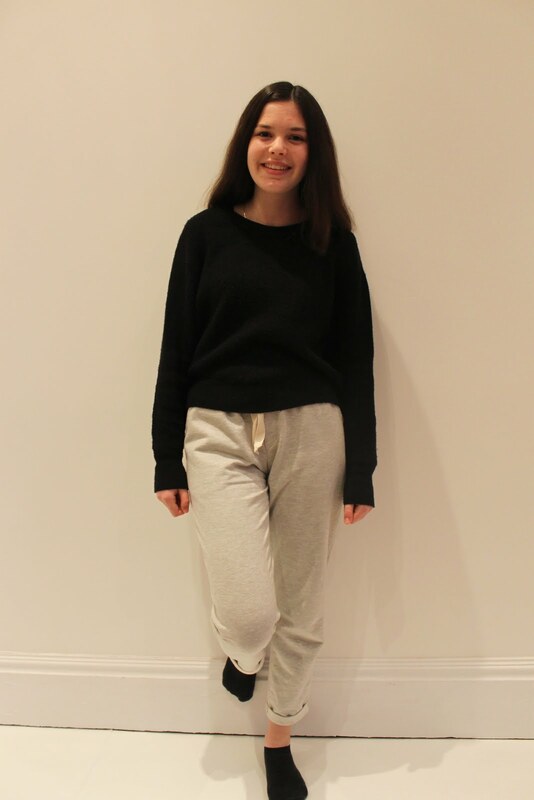 The inside is so soft and snuggly too making the joggers even more comfortable. The fabric was an absolute joy to sew with, partly because it has little stretch. As you've probably guessed by now I love these trousers so, so much. I have already worn them lots and I'm sure that I will continue to wear them throughout the rest of winter and well into spring. I'm looking forward to making a second pair already and I'm also hoping to use the pattern with other fabrics too, with a few adaptations it should work well for lots of different fabrics. The trousers look really cute! I like the faux fly detail too.